Shortly after I started making steampunk masks I mentioned to my son Jesse that I was working on a mask design that resembled a mosquito. He suggested that I make one to look like an elephant. Thus was born the idea of Pachydermos. The mosquito mask never got past the drawing board. Pachydermos features a leather trunk that is folded back upon itself to resemble an elephant's proboscis. For the long lower section of trunk I wrapped thin leather around a vacuum cleaner hose. I constructed a large respirator canister from laser-cut acrylic, then molded it and cast the pair in cold cast bronze. I made them hollow so they wouldn't add too much weight. And then my favorite part, the copper ears, I fabricated from two lamp reflectors. At the bottom of the trunk I fastened a sphygmomanometer gauge. THe mask is all handstitched with waxed thread and stained an antique brown. The lenses are clear acrylic. I liked Pachydermos a lot but thought that I could improve it, and after it sold I decided to make another but slightly different. Different in fact that I give it a new name: Olifant aka Son of Pachydermos. I made two changes, in addition to the coloring. I felt that the vacuum hose trunk was too long, and I had been interested in working with neoprene, so I made a new shorter black rubber trunk. 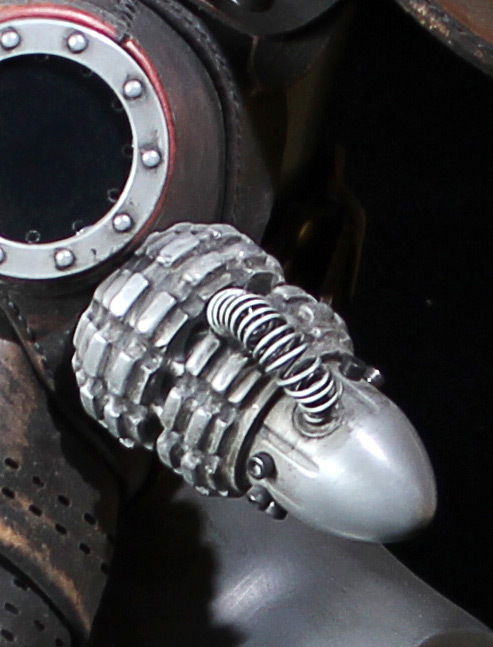 And since the canisters had been used already on a respirator, I built new ones and cast them in cold cast aluminum. Everything else I left the same. I was commissioned a few years ago to make several masks for the Los Angeles Opera's production of Verdi's I due Foscari . 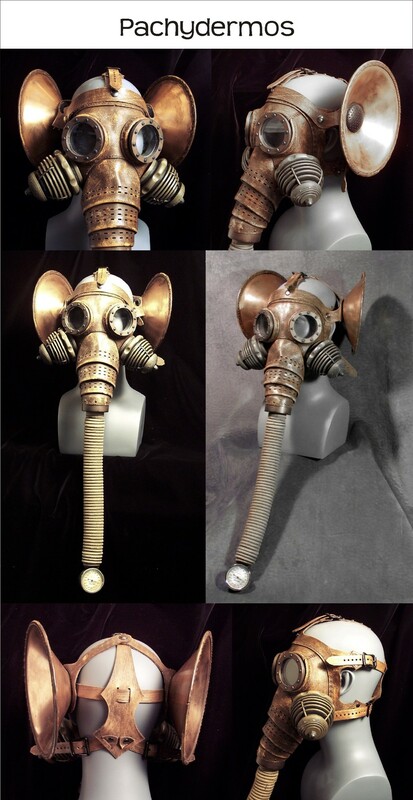 One of them was based on my elephantine mask design. I changed the ears, making them of leather. I also changed the eyepieces, respirators, and trunk.